Dry eyes are a common problem especially in women and in those over 60. True dry eye or keratoconjunctivitis sicca, is due to insufficient aqueous (water) tear production by the lacrimal gland. The lacrimal gland is situated under the outer aspect of the upper eyelid. Dry eye symptoms may also occur if other components of the tears (mucus and lipid) are insufficient in the presence of eyelid or conjunctival disease such as blepharitis (inflammation of the eyelids) or when normal blinking is disrupted by neurological or eyelid abnormalities. 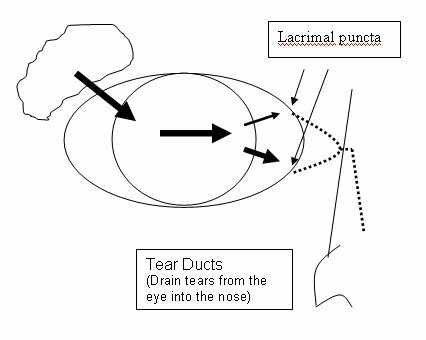 The main constituent of tears are water (the aqueous component), secreted by the lacrimal gland. This is required to moisten the eye, wash away debris and provide a smooth corneal surface for optimal focusing. The lacrimal gland also secretes antibodies and antibacterial elements to protect the eye. An oily, outer, lipid layer is secreted mainly by glands within the eyelids (the Meibomian Glands) and is required for lubrication for blinking and to lessen tear evaporation. An inner mucus layer, secreted by glands within the conjunctiva, is required for even spreading of the tears over the eye surface. Dry eyes occur as a part of the natural ageing process, especially after the menopause. Certain types of drugs including some varieties of antihistamines, antidepressants, blood pressure drugs, Parkinson's medications and contraceptive pills may reduce lacrimal gland secretions. Such medical conditions include Sjogren's syndrome, which may occur either alone (associated with a dry mouth) or with other rheumatological diseases, such as Rheumatoid Arthritis and Systemic Lupus Erythematosis. May occur in ocular cicatricial pemphigoid (OCP), Stevens-Johnson syndrome, chemical burns. Can be seen after laser refractive surgery (LASIK) as a temporary phenomenon due to damage to the corneal nerves. These nerves usually regenerate and dryness typically improves. Can occasionally cause permanent problems and individuals with significant dry eye should not undergo LASIK treatment. May occur with Meibomian Gland Dysfunction, which is often a result of Blepharitis (inflammation of the eyelids) which causes inflammation and blockage of the Meibomian glands. Prevents the spread of tears over the eye and allows excessive tear evaporation. Can occur with trauma and neurological problems such as strokes, Bell palsy. Using a Slit-lamp (an instrument used by eye doctors to obtain a magnified image of a patient's eye) the tear meniscus on the lower lid margin can be seen to be reduced. Strands of mucus may be seen in the tear film. Abnormalities of the cornea can often be seen with loss and damage to the corneal epithelium (corneal skin cells). These areas of damage can be highlighted using a special yellow dye called Fluorescein. Filaments of mucus may be seen to attach themselves to the corneal surface, as can plaques of mucus. After instilling the yellow dye fluorescein into the eye, the time taken for the tear film to begin to break-up and dry patches appear with the eye constantly open is measured. Normal values are greater than 10 seconds. In this test a thin strip of filter paper is placed with one end inside the lower eyelid and the other end sticking out of the eye. The amount of tears the filter paper has soaked up after 5 minutes is measured. Similar tests can be performed using dye impregnated threads. Other specialist tests may include taking tear samples to analyse its osmolarity and enzymatic levels and the use of special dyes (Lissamine green, Rose Bengal) to investigate cell damage on the surface of the eye. Slightly lower room temperature to reduce tear evaporation (temperature should not be excessively reduced, especially in the elderly). Avoid air conditioning. Room humidifiers may be tried. Avoid/reduce contact lens wear. In severe dry eye contact lens wear is contraindicated due to infection risk. Take regular breaks when reading, using computer, watching TV etc. as we all unconsciously blink less when performing intensive visual tasks and thus the eyes can dry out more. With poor/incomplete lid closure an operation called a lateral tarsorrhaphy may be required to sew the outer edges of the eyelids together. Medications to suppress the immune system and prevent further lacrimal gland damage, including steroids, may be required in diseases where there is destruction/inflammation of the lacrimal gland. These should be administered in conjunction with specialist referral to a Rheumatologist. Treat evaporative eye-lid disease/blepharitis (eyelid inflammation) with eyelid cleaning and tetracycline antibiotics by mouth to improve meibomian gland function and the lipid component of the tear film. Flaxseed oil/Omega-3 supplements have been shown to be beneficial. This is the mainstay of treatment. Tear replacement drops need to be taken regularly especially when reading and working on the computer and can improve eye comfort and prevent further damage from prolonged drying of the surface of the eye. Eye-drops - There are numerous brands with different types suiting different individuals. The two main types are hypromellose (Hypromellose 0.3%, Tears Naturelle) and polyvinyl alcohol (Liquifilm, Snotears). Most are available over the counter without prescription and are usually cheaper than the current prescription charge. Preservative-free drops, such as Celluvisc 0.5% and 1.0%, are available in single dose units for those who become sensitive to preservatives and are also advisable in those using artificial tear drops more than four times a day. The main problem with artificial tear eye-drops is that they are only effective for limited period and require frequent usage. Eye-gels - such as Viscotears, consist of carbomers and have the advantage that due to their chemical composition they last longer and have to be instilled less frequently. Eye-ointments - These contain petrolatum oil (Lacrilube, Simple eye ointment) and can be useful in lubricating the eye overnight. As they are sticky, their use during the day is limited as they tend to blur vision. Mucolytic eye-drops such as acetylcysteine (ILube) can be used to break up mucus filaments and mucus plaques, if present. Cyclosporin 0.05% (Restasis) eye-drops. These are anti-inflammatory drops and not available in the UK, although Moorfields Pharmacy now manufacture Cyclosporin 0.06%. They have been shown to increase tear production in some individuals with chronic eye inflammation. The drainage holes (the lacrimal puncta) on the inner aspect of the upper and lower eyelids can be occluded either temporarily with punctal plugs (silicone or collagen) or permanently with cautery (burning). 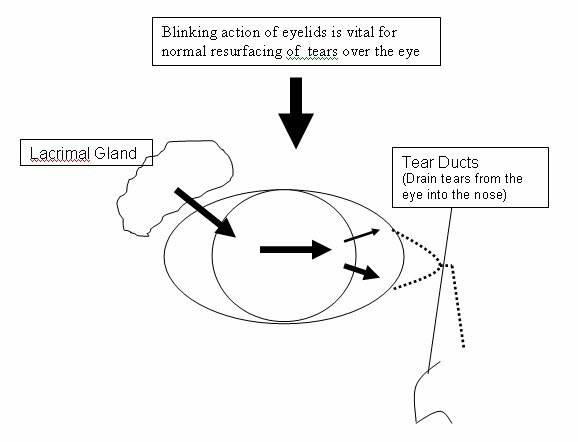 This will reduce/prevent tear drainage from the eye surface into the nose (see diagram above). Most of the drainage (about 70%) goes through the lower punctum. This is usually occluded first with a temporary plug, which if it is silicone can be removed if there is excessive watering, and if it is collagen will dissolve over a few weeks. Temporary plugs are easily inserted as a quick, painless out-patient procedure in the clinic using anaesthetic eye drops. If symptoms are not sufficiently relieved then the upper punctum can be plugged. Permanent closure (cautery) of the puncta should only be performed if temporary plugging has been unsuccessful. This is a simple out-patient surgical procedure, performed using a local anaesthetic injection into the skin of the eyelid.